Canal Winchester Village Hall is located at 36 South High Street, Canal Winchester OH 43100; phone: 614-837-7493. Photo: Helpman-Chaney House, ca. 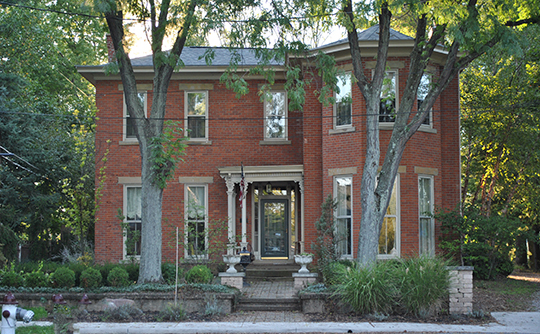 1905, 132 West Columbus St., Canal Winchester, OH. Listed on the National Register of Historic Places in 1989. Photographed by User:Wdzinc (own work), 2012, [cc-by-3.0 (creativecommons.org/licenses/by/3.0)], via Wikimedia Commons, accessed March, 2017. Canal Winchester is located in Congress Lands first surveyed in 1799. The town was initially situated in Violet Township, Fairfield County, and then six sections in a vertical strip were annexed to Madison Township, Franklin County in 1851. Early settlers in this area (arriving in the 1800's and 1810's) were from Virginia (including the Doves who arrived from Winchester in 1811, hence the Winchester name), Maryland, Pennsylvania, Kentucky, New Jersey and other Mid-Atlantic states. Settlers were few in numbers prior to construction of the canal because of a lack of a convenient market for surplus produce, sickness and high taxes. Crop prices were low, and even then there was no market for them, (corn, 1O-12 cents/bushel, wheat, 2O-25 cents/bushel, and pork, $1.50/100 pounds). Canal Winchester is situated in the southeast corner of Franklin County, midpoint, between Columbus and Lancaster (two county seats), approximately 2O miles southwest of Columbus. Canal Winchester's growth has been steady throughout its history, however the most active periods of development occurred in response to transportation developments. The first was the construction of the Ohio & Erie Canal (1827), with construction of the Hocking Valley Railroad (1869) and the Scioto Valley Traction Co. Interurban (1905) following. The canal and railroad expanded the markets for the local crops and defined Canal Winchester's role as the local grain distribution center and as the commercial center for the surrounding area. The town's prosperity from the agricultural-related activity is illustrated in the general growth and quality of the residential and commercial areas in the 19th and early 20th centuries. Since World War II, the economy of Canal Winchester has become more diversified and much less dependent on agriculture. Now considered part of the Columbus metropolitan area, the town is being significantly affected by the rapid residential, commercial, and industrial development and general expansion of surrounding communities. This growth is posing serious threats to the agricultural landscape of Madison Township and rural areas within the corporate limits of Canal Winchester. For example, the acreage in the vicinity of U.S. 33 and Bowen Road has been zoned for commercial use, and local tax abatement programs are offered to industrial developers in the U.S. 33 and Gender Road area, although currently zoned for single-family residential use. New residential development is occurring on the town's south side, also extending into what was once prime agricultural land. Kathy Mast Kane, Historic Preservation Consultant, Canal Winchester Multiple Resource Area, nomination document, 1988, National Park Service, National Register of Historic Places, Washington, D.C.